Much like Utah before it, we went into Arizona with a head full of stereotypes and not much else. We knew its warm, arid weather was a big draw to the retired set (many a Canadian snowbird flocks there in the wintertime) and, consequently, the state tends to skew scarily conservative on the political spectrum. Reading about Sedona, the city seemed like it would be a breath of fresh air, a hippie haven filled with tree-hugger pacifists that would be more our speed. 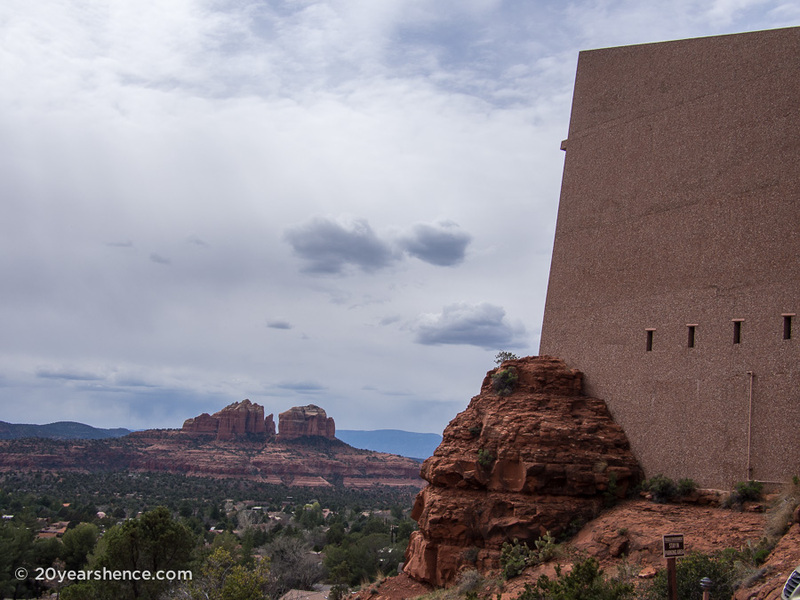 Driving through the outskirts of Sedona, it was immediately apparent what originally drew people to the area: nestled in something of a valley, the surrounding countryside is absolutely gorgeous! Every day on our road trip I kept thinking we had hit the apex of how beautiful nature could be, only to be proven wrong the next day. 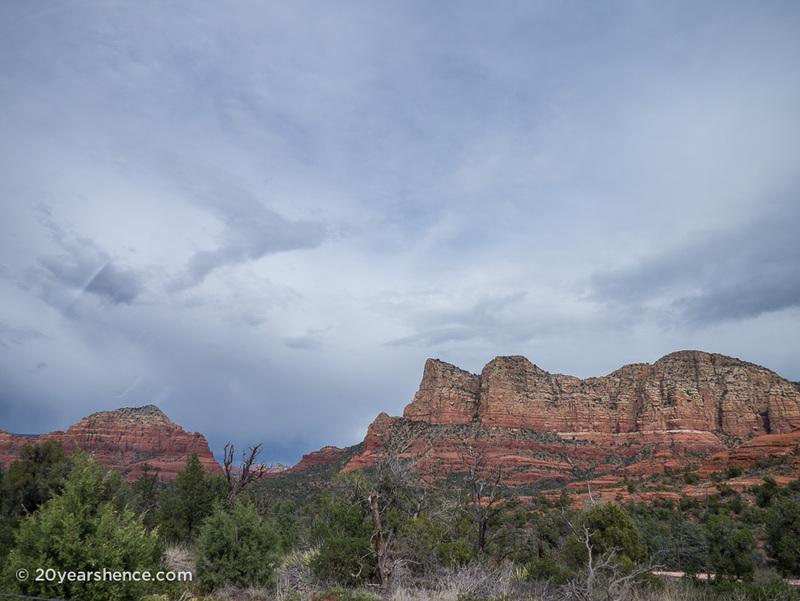 Sedona and its astounding red rock sandstone formations was just another example of this. 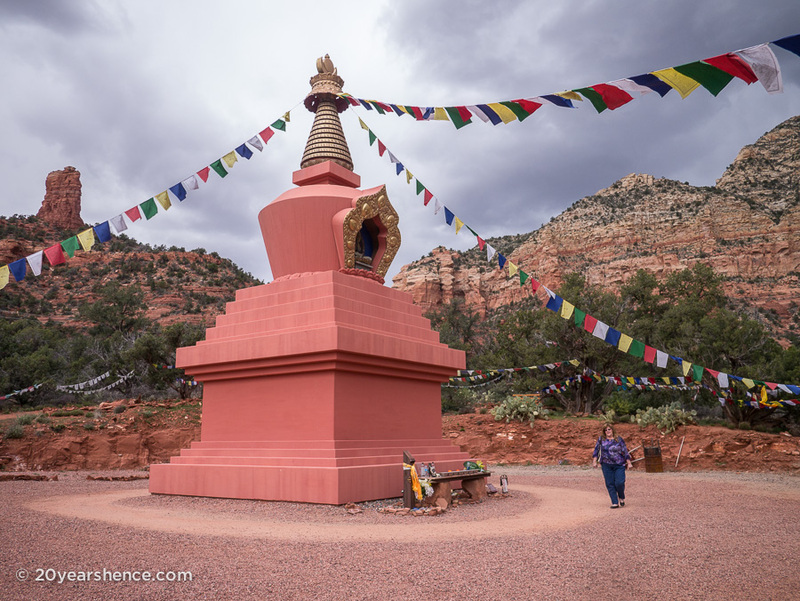 It’s impossible to view the land around Sedona and not feel awestruck; perhaps this is why a legend has built up over time about the inherent spirituality and transformative energy of the place. As we made our way through town, dodging zippy golf carts and dune buggies, we realized that Sedona wasn’t a quaint, sleepy hippy town. No, it’s a new age epicenter and a money-making machine. The main drag was devoted to shops flogging crystals, aura alignments, chakra cleanses and healing energy vortices. There were bourgeoisie boutiques selling wide-legged floaty pants and gauzy tunics—the kind you’d wear to a detox center or an ashram while starring in your own “Eat, Pray, Love”—fancy wine stores and jazz bars. The streets were filled with white people with too much money who greet you, palms together, with “Namaste” instead of “Hello”. Feeling disgruntled and rebellious, we breezed past the frou frou cafés selling overpriced organic salads and defiantly pulled into the McDonald’s. Because yes, despite its enlightened aspirations, Sedona has a McDonald’s, and no matter how much “my body is a temple” mumbo jumbo goes on there, the place was packed. Although we had been contemplating busting our budget for a few days to hang out there (hotel prices are insane in and around Sedona), our drive through town had grossed us out so much that, while munching on fries, we admitted that we couldn’t remember the last time we were so repulsed by a place. 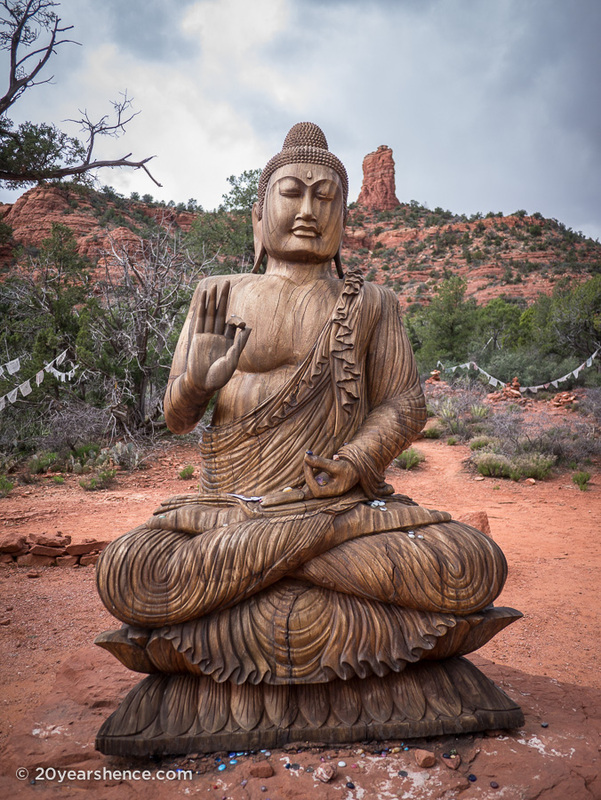 Knowing that there was little to no chance we would ever willingly come back to Sedona, we decided to spend the afternoon squeezing in the two things that we had flagged in advance as looking pretty cool. 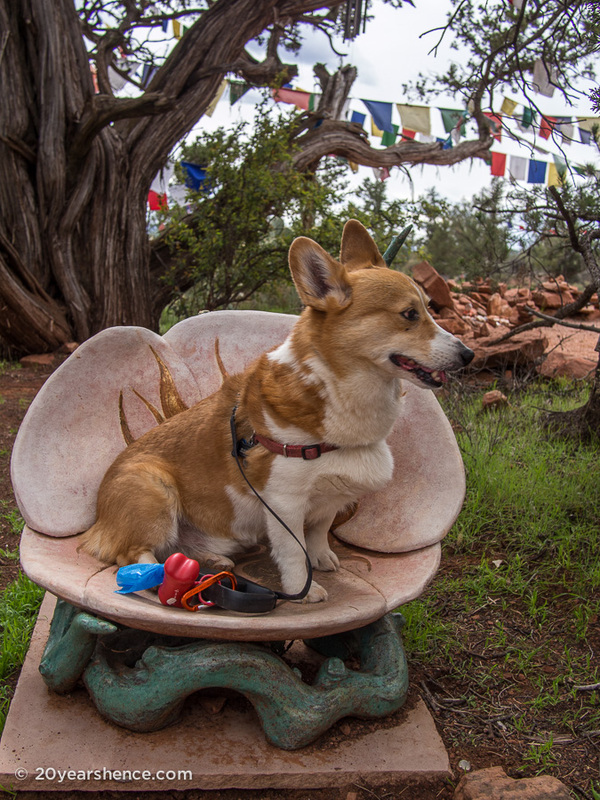 Of course, this being Sedona, they both had a spiritual component to them. 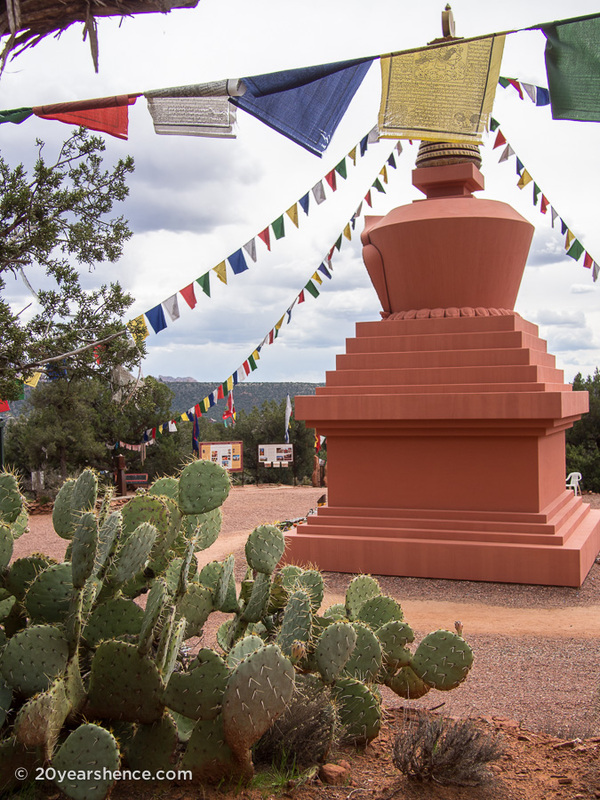 Our first stop was the Amitabha Stupa & Peace Park, a quiet, dog-friendly little place on the periphery of town, where we could stretch our legs and enjoy the legitimate beauty of the area. 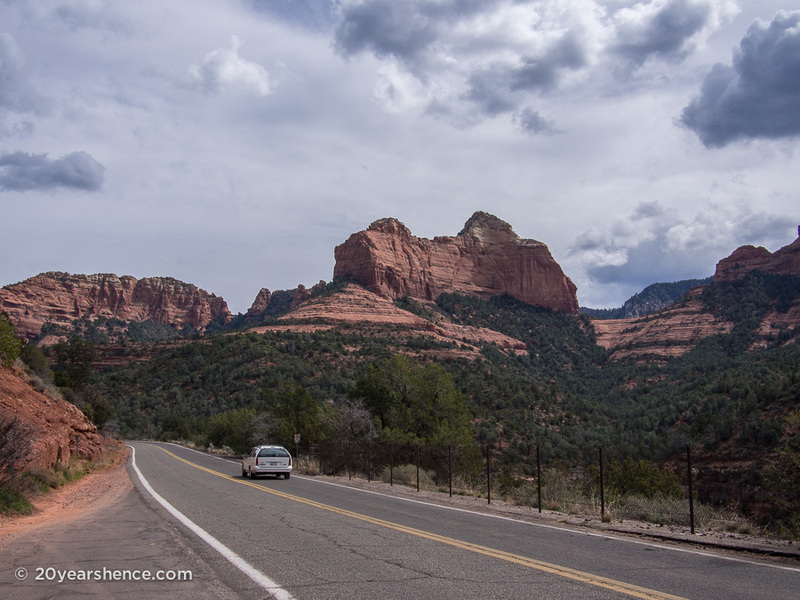 We hadn’t driven very far from the core of Sedona and I suppose this isn’t the kind of attraction that most people seek out when they visit the area as we pretty much had the grounds entirely to ourselves, but we were immediately happier out there on the fringes. Maybe the energy flow was better there or was tuned to our frequency, I don’t know. 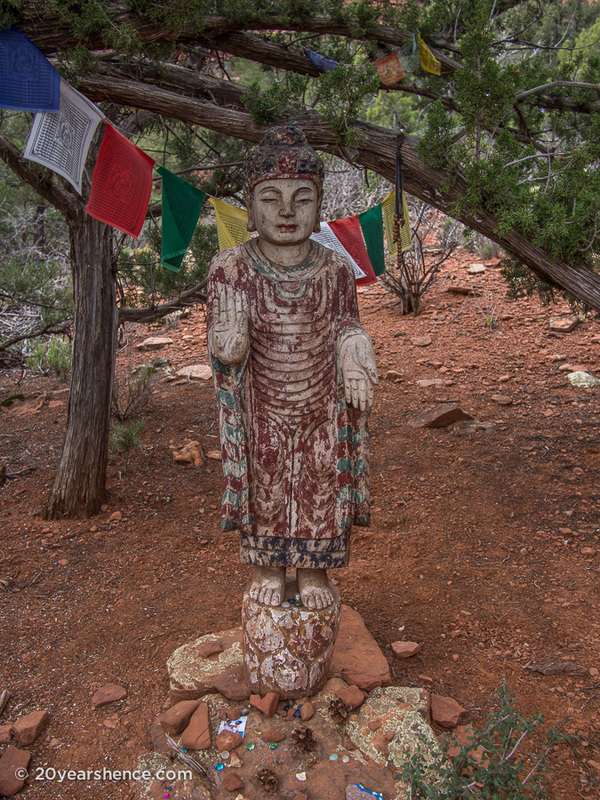 All I can say is that after so long away from Asia, it felt good to find a bit of the East all the way out there in the Southwest, to hear the flapping of fluttering prayer flags as we wended our way through the rusty desert sands where Buddha statues sat in quiet contemplation beside scrubby succulents and cacti. Our second stop was definitely more on the beaten path as we made our way to the Chapel of the Holy Cross. Constructed in 1956 and built directly into a rock face, it’s one of Sedona’s most popular attractions. And for good reason! Though we tend to prefer temples over churches, we both agreed that from an architectural standpoint, this church was incredibly striking. The interior is not remarkable, however, the views you get from the cliff where the church is perched are breathtaking and worth the visit. And that pretty much covers the entirety of our visit to Sedona. For some, the place is heaven on earth, and I get how people can be sucked in by the natural beauty of the area—once you get out of the city, it’s so very lovely! Unfortunately, we just couldn’t look past Sedona itself, which really was our personal version of hell. I’m not sad we visited as we appreciated the pretty bits and I also know that if we hadn’t seen it for ourselves, we always would have wondered what we were missing out on. 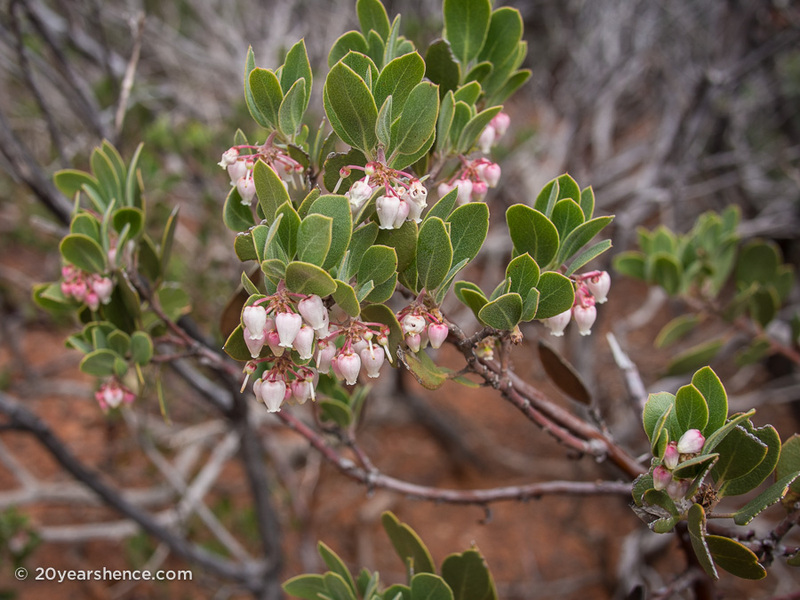 Still, for all the talk we heard being bandied about over wheatgrass smoothies regarding harmony and positive energy, we just felt like we were mired in some real bad juju while we were in Sedona. Maybe Mercury was in retrograde. Maybe we should have splashed out on aligning our auras. Whatever the case, we came, we saw, and then we got the hell out of there. Now it’s your turn: Have you ever visited somewhere that you hated at first sight? 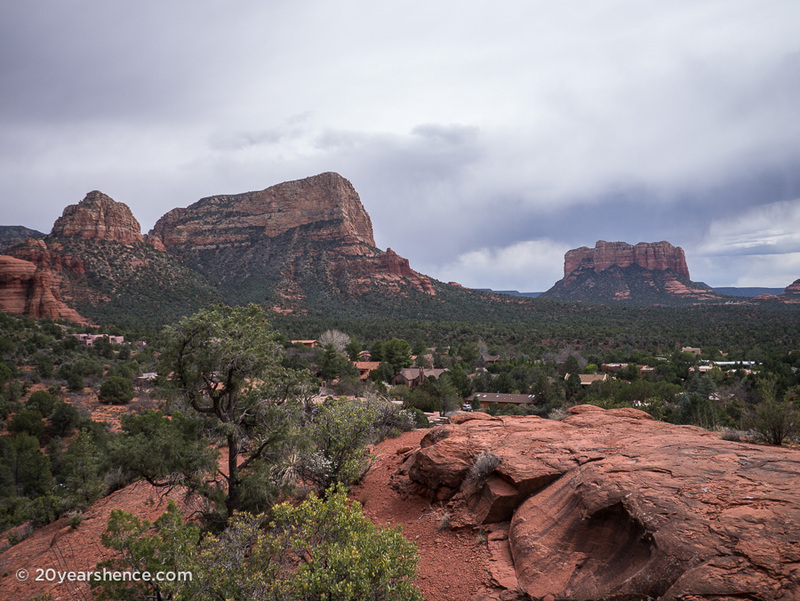 Does Sedona seem like the kind of place you would like to visit? And what the heck is an energy vortex anyway? I didn’t hate it at first sight, but I grew to hate Hong Kong. I know that’s like Asian travel blasphemy, but I just can’t stand the place – I find it crass, boring and depressing. As for hate at first sight, that would have been Yarram in Australia’s Gippsland region – there was nothing about that place which I liked – bad vibe overall. If you aren’t a fan of a big cities, then I could definitely see how HK wouldn’t be a good fit for you. Personally, it reminded me of the craziest Chinatown I had ever been too and the food was so good that I couldn’t help but love it. I’m sure it also helped that we had local friends there who were able to suggest activities that you don’t find in guide books and so we were able to see more of the city than just its main commercial hub. I’ve never even heard of Yarram, but a quick Google search suggests it probably would feel quite close and creepy! 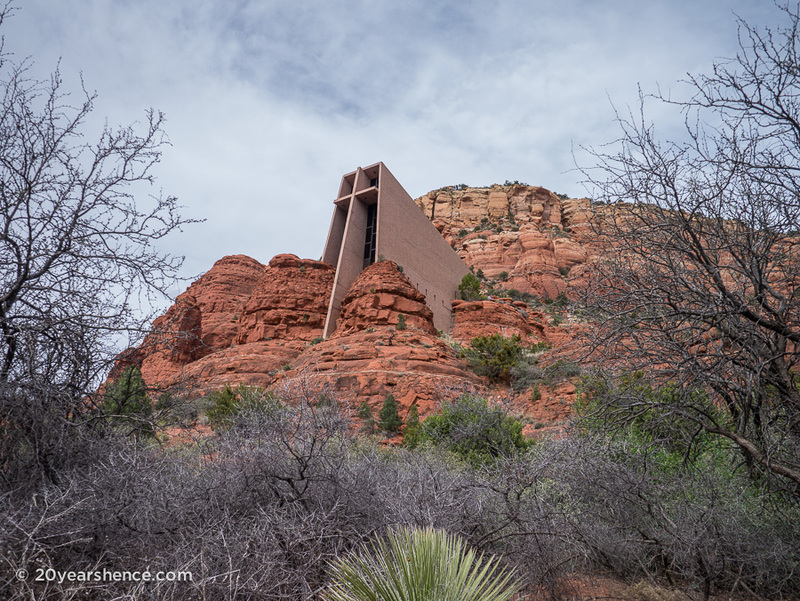 Sounds like Sedona was a place for phonies,but I liked the huge church,I bet it was a nightmare to build!!! !Tony check your email,,,we’re losing touch!!! Ha ha! Yeah, Sedona REALLY wasn’t our scene but it was cool getting to see that church. We’ve never seen anything like it and it was really beautiful. We visited Sedona about nine years ago and also found the spiritual aspect to be really annoying. I could go the rest of my life without hearing the word “Namaste” again and be perfectly happy. However, we stayed in an awesome bed and breakfast and really enjoyed hiking in the area so I certainly didn’t hate Sedona but I doubt I’ll ever go back either. I definitely understand why people are drawn to the area since the natural surroundings really are gorgeous, but we really found the vibe of Sedona unpleasant and offputting. The prices were also problematic for us, and while I’m sure it would have been nice to spend a bit more time there so we could take in some more of the natural attractions, I am ultimately satisfied with what we were able to accomplish in just one afternoon. 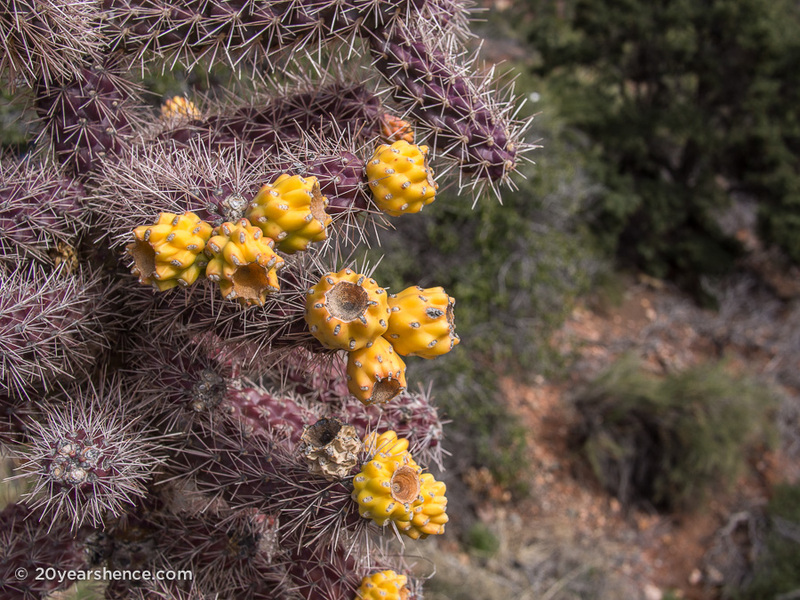 There is no shortage of beautiful hikes and outdoor activities in that part of the US, so I’d rather be somewhere that doesn’t have all the other issues of Sedona to experience them! I do see where you are coming from but I can’t say it bothered me. I loved the surrounding scenery and I really like crystal shops so I was happy during my short two night stay. I would definitely go back to do some hiking around the area as we only had time to do a couple of short ones. 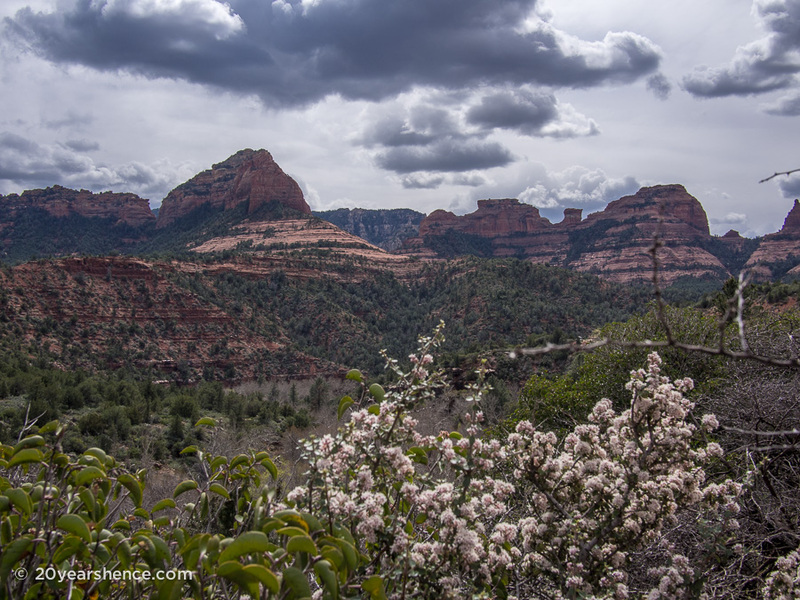 I suppose we should have known that Sedona wouldn’t have really been a good fit for us… after all, we were driven batty by a similar scene when we were on Bali and spent some time in Ubud! 😉 I think it would have been one thing if there had been one or two crystal shops, but the fact that the entire town seemed to be overrun with them and clearly seemed to be devoted to relieving tourists from as much money as possible was a huge turn off. It’s a shame because the surroundings really are beautiful, but we definitely preferred our other stops in the U.S. that were far more low-key.